Shares of Flughafen Wien AG offer the chance to invest in critical world-class infrastructure at a singularly low valuation. Flughafen Wien is insulated from competition, only modestly leveraged, and its services are critical to the modern economy. Long-time readers may know I have an affinity for businesses that are insulated from competition and enjoy at least a degree of pricing power. Past examples include Jungfraubahn AG (nobody’s constructing major new tourist railways in the environmentally-sensitive Swiss Alps) and Logistec Inc. (Cargo needs to be loaded and unloaded at a specific port. There are few alternatives.) Shares in companies like these exhibit highly desirable “equity bond” characteristics where long-term shareholder returns will approximate the current earnings yield plus organic unit demand growth plus inflation. The best of these companies rarely experience declining or stagnant earnings due to the critical nature of their operations and their strong competitive positions. Because of the stability and strong long-term outlooks that these businesses typically enjoy, they often trade at bond-like earnings yields. Not so for Flughafen Wien. While competitors offer free cash flow yields as low as 3%, Flughafen Wien offers a free cash flow yield of nearly 8%, despite a strong outlook. 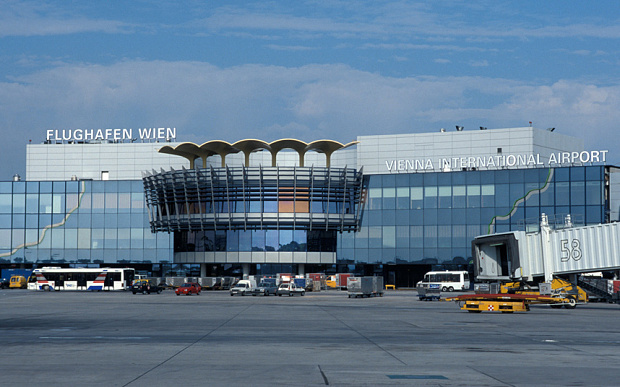 So what does Flughafen Wien actually do? Simple. The company owns and operates the Vienna International Airport along the Danube River to the south-east of Vienna, Austria. Additionally, the company owns a 48% interest in Malta International Airport and a 66% interest in Slovakia’s Košice Airport. The Vienna Airport is, of course, the company’s major asset. The airport was originally built in 1938 as a military facility, then taken over by the British following World War II. The Austrian government expanded and improved the airport over the following five decades, and privatized it in 1992. Today, just 11.8% of the company’s shares are freely floating. 50% are owned by local governments and an employee ownership plan, and 38.2% are owned by a major Australian infrastructure investment group, IFM Global Infrastructure Fund. IFM has expanded its ownership aggressively in recent years, but more on that later. About 55% of the company’s revenues are its airport operations: collecting income from passengers and airlines who use the airport facilities. The next biggest segment is “Handling” at 23% of revenues. Handling refers to a variety of activities including prepping aircraft between flights, loading and unloading cargo, security services, and other services that ease the movement of passengers and aircraft. A further 20% of revenues consists of retail and property revenues associated with parking, rents on commercial storefronts and restaurant spaces within the airport, advertising space, and more. While it is the smallest of the three major revenue segments, Retail and Properties actually accounts for 48% of the company’s operating income. Airport operations are the second most profitable segment, making up 37% of EBIT, while Handling contributes less than 10%. The graphic below from the 2015 annual report illustrates this more clearly. Recent years have been good for the Vienna Airport with steady passenger growth and rapid improvement in financial results. This is despite weak economies and instability in destinations to Vienna’s east, especially in Russia and Ukraine. From 2010 to 2015, annual passenger movement at Vienna International Airport rose at an annual rate of 3.0%. Strong operating leverage (a high percentage of fixed costs vs. variable costs) allowed operating income to rise by 6.9% annually over the same period. Meanwhile, net debt has been cut in half. Things were not always so rosy at Flughafen Wien. As recently as 2011, the firm was troubled by massive cost over-runs in the construction of its Skylink addition to Terminal 2. But a new management team and a scaled-back capex program righted the ship and the company is now on solid operational and financial footing. At Eur 22 per share, Flughafen Wien trades at less than 8x EBITDA and a P/E of 17.2, with a free cash flow yield of 7.8%. This represents a very large discount to the valuations of other major European airports and airport groups. The graphic below displays financial statistics for other publicly-traded European airport operators. Figures are in millions USD using today’s exchange rates. You will see that Flughafen Wien’s valuation compares very favorably to its peer group, despite above average revenue growth and below average leverage. The only area where the company comes up short is its operating margin, which is slightly below its peers. The Copenhagen is the clear superior operator of the group, with excellent revenue growth and margins. But that is fully reflected in its premium valuation. The only other operator with similar figures to Flughafen Wien is Fraport AG. However, Fraport (which operates the Frankfurt airport) suffers from sub-par operating margins and carries a large amount of debt. So why does Flughafen Wien trade at a material discount to its peer group? The biggest reason is likely the market’s nervousness about the company’s major destinations outside of Western Europe. 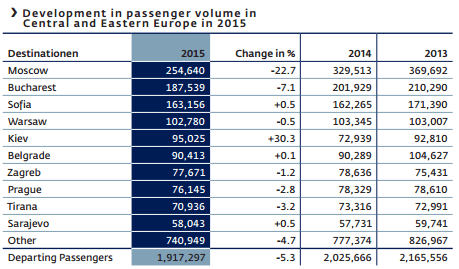 Departures to Central and Eastern Europe were down 5.3% in 2015 and down 14% from the peak in 2012. Moscow in particular has experienced a serious decline. The market likely fears further declines in departures, which is entirely possible given the threat of Russian aggression and continued sluggish economic conditions. Then there is the prospect of major capital projects on the horizon. Flughafen has elected to go forward with a project to modernize and expand its facilities, to the tune of Eur 500 million between now and 2023. The company says the project will enhance its profits, especially via the creation of additional shopping and restaurant space, but investors may be justifiably nervous about potential cost over-runs and delays. Investors may have short memories, but their memories are not short enough to forget that a botched expansion nearly brought down the company only five years ago. I believe this risk is mitigated by the new management team and Flughafen Wien’s very reasonable leverage, but the risk remains. Finally, there is the fact that Flughafen Wien is one of the smallest public European airport operators, with few shares in public hands. The 11.8% of the company held by the public is worth only Eur 218 million at current prices, ruling out investment in the company for most infrastructure funds and other investment companies of size. And that’s where the opportunity lays. Readers should know I have absolutely no qualms about investing in controlled companies, so long as the controlling shareholders are motivated to increase shareholder returns. This is certainly the case with Flughafen Wien with IFM owning nearly 40% of shares. There is also a meaningful possibility that IFM will take steps to further increase its ownership. IFM’s first tender offer came in November 2014. IFM paid 20.50 Euros (split-adjusted) per share and netted 29.9% of the company. The second tender offer made in April 2016 collected another 8.3% of shares. This time, IFM paid Eur 25.00 (again, split-adjusted) per share. What price might IFM offer in a third round? Whatever that price may be, another holder of Flughafen Wien stock thinks previous offers have been far too low. The UK’s Petrus Advisers put out a presentation supporting its view that Flughafen Wien shares are worth as much as Eur 36.50 per share, after accounting for the 4-for-1 share split that Flughafen Wien recently did. It honestly concerns me little whether IFM tenders for the rest of the publicly-held shares or not. I am happy to hold a top-quality infrastructure asset at a low-grade valuation for as long as the market allows me. 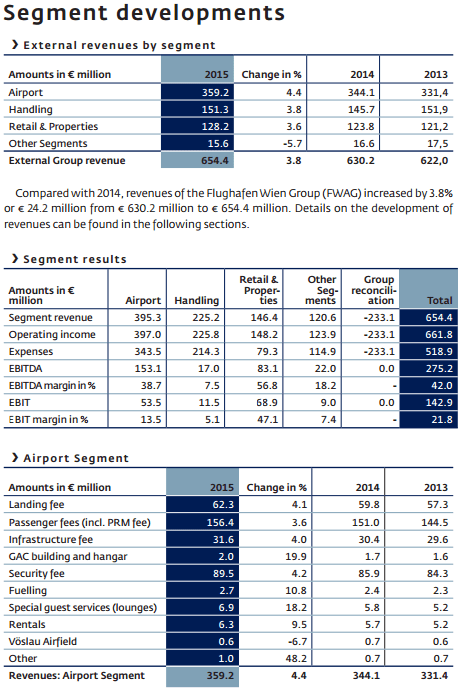 Alluvial Capital Management, LLC holds shares of Flughafen Wien AG. for client accounts. Alluvial may buy or sell shares of Flughafen Wien AG at any time. Nice post. It’s prompting me to take a fresh look at the stock. One additional thing you might want to account for is the third runway. Zurich and Wien are similar sized cities with similar annual traffic, but Zurich already has the third runway laid. Wien is considering adding one in the next 5 or so years. I don’t know the cost, but it won’t come cheap. I’d also guess that Flughafen Wien has been underspending a bit on maintenance capex in recent years, potentially distorting FCF yield although certainly not destroying the case. The shopping/retail experience is still pretty poor, better than 5 years ago but still not great. I view that as an upside opportunity. Yes, I would agree that capex has been somewhat subdued for some time and it should pick up once again soon. On the other hand, I view Flughafen Wien’s low leverage as a plus; they’ll be able to finance expansion at reasonable rates by taking on additional debt. I’ve never been to Vienna (would love to go!) but it’s interesting that the shopping experience remains sub-par. Most airports are making serious attempts to improve their retail and dining options, and I expect Wien will as well. I know that you invest for the long-term, which I agree is the best strategy. One thing that I did not see is any mention of is the cylicality of international travel and the degree to which it affects the business. With regard to a third runway, keeping in mind that I have not read a lot about this, I was wondering whether there is meaningful public opposition to a third runway. I remember 4 years ago being delayed for hours flying into Muinch because they only have two runways. While a third one has been applied for and approved, public opposition in Munich has been enough to forstall building the runway. Do you have any sense of whether such opposition exists in Wien? Austria has a withholding tax rate of 27.5% as of 2016. If one where to hold the shares for multiple years it would cause a small drag on the total return although I am not a citizen of the US so i dont know the specific effect for you. Do you consider withholding tax when evaluation potential investment opportunities? Personally I do myself and Austria looks grim. At the current dividend of 0.5EUR it reduces return by 0.6% pr year. I definitely do consider taxation when looking at foreign investments. For that reason, I prefer to buy foreign investments only when I expect to achieve the majority of my return from capital appreciation, not dividends. Thanks for the excellent find. Interactive brokers don’t seem to offer this. Any advice? I know that you can do this transaction through Fidelity, albeit at a higher commission overall than on IB. It’s there. Try FLW on the Vienna Exchange. IB definitely does not make it easy to find foreign stocks sometimes. thanks for holding this thread up its great fun to read. Allow me q quick remark on FCF and CAPEX. Maint.CAPEX is around €75-100m p.a. against 140m D&A. On top of that the company will spend € 500m in CAPEX for modernizing Terminal 2 plus some Shopping Centres. Thus another 100m p.a. -> reducing FCF to ca. 60/70m p.a. in the 18-23 period leaving a 3% FCF yield. For what it’s worth, my guess is that any money spent modernizing Terminal 2 will generate good incremental returns over time and will be shareholder money well spent. It’s the spending on runway 3, when it comes one day, that will be less likely to pay its way in terms of incremental returns. I’d challenge that math by asserting that the modernization of Terminal 2 will be largely debt-funded and won’t have a major impact on free cash flow available to shareholders. Flughafen Wien is materially under-leveraged compared to peers. I believe the company can easily borrow virtually the entire cost of the project and maintain that level of leverage going forward, with no reduction in the company’s capacity for dividends. Following on from your comments, OTC. My understanding was the EUR500m is for few purposes – centralizing security (hopefully cutting costs and also opening up all three terminals for those past the security gate. Currently you can get stuck in some pretty boring/unappealing enclaves), modernizing T2 (okay, I can see how this might not incremental return, but it is haggard today and a freshen up will make the experience more pleasant and productive, addition of 10,000sqm of retail space to T3 (should be highly accretive to earnings, and that space will now be open to all passengers passed security clearance). Terminal spending by airports is generally money well spent. Would be rather surprised if that’s not the case here. Hi Dave, sure they could borrow but they wont: the company expects debt-ebitda to remain well below 2x – meaning that they will predominantly use operating cashflow to fund the modernization. You could add to your work the spanish airport operator Aena. It’s trading at 13,8 times EV/EBITDA.